Point ground laces include Bucks point, Tonder, Bayeux, Chantilly, Blonde, Beveren and others that use the CTTT ground. 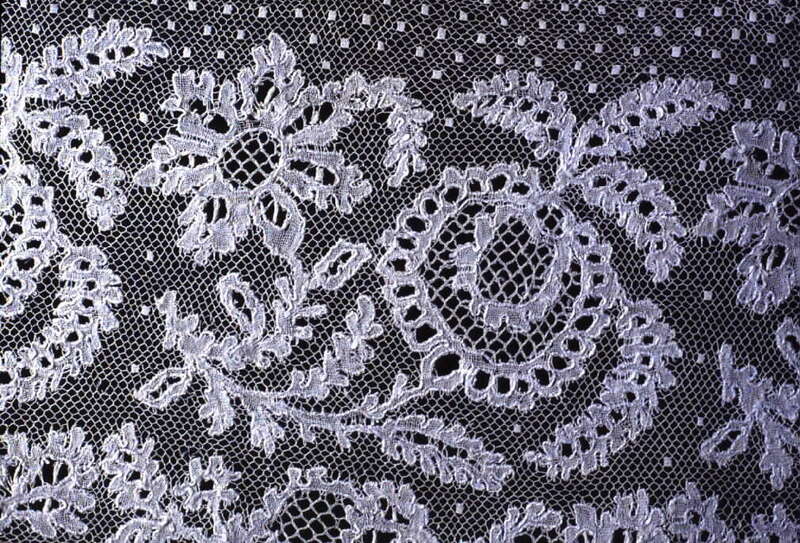 During the 19th century virtually every nation that had a bobbin lace making tradition produced some form of point ground lace. Started by Joan Williams Near. Last reply by Elizabeth Ligeti Oct 12, 2016. Started by Arzhela LE MAITRE. Last reply by Arzhela LE MAITRE Apr 19, 2016. Started by Joan Williams Near. Last reply by Nancy Baldwin Dec 6, 2015. Started by Lorelei Halley Administrator Sep 30, 2015. You need to be a member of Point Ground Laces to add comments! This book notice appeared on facebook today. It appears that it may be mostly point ground laces. Two of them look similar to patterns in another book. I haven't seen this, but the blurb does suggest it has patterns. Hi Holly, My children bought me a book for Christmas, which might be a big help to you. It is The Grammar of Point Ground by Ulrike Voelcker. It isn't really a how to book but a technique book, which I guess is a how to book. It is a small beautifully bound book, which remains open to the page you are viewing. The descriptions are in German and well translated into English. The diagrams and photos are excellent. It starts simple and works up to more involved techniques. There are a few projects in the back to practice various techniques. In general the working order would be similar to that used in torchon. Prepare all the ground above a cloth stitch or half stitch area, as far as you can go. Then work the motif. Then the ground below the motif, etc. Holly, keep in mind that the diagram is your friend when analyzing the order of work. Try enlarging it, and, without even looking at your pillow and threads, take a set of colored pens, pencils, or highlighters. Beginning with where you hang on the pairs, color the first stitch (I'm not talking about the standard color code here; you're looking to color each section as far as you can work without pulling from another section. Use any colors to distinguish.) Look for where those pairs go next, and color the next stitch(es) the same color, as long as they're within the same section (that is, not entering or leaving a motif or other element). Continue until you need a pair added or pulled from another section that's not yet colored. Find the next section that's now ready to work, and switch colors, and repeat, coloring each stitch until you need to pull from an unworked section. Are you still working from Visual Introduction? If you let me know which pattern, I can show an example of what I mean. Hi Holly :-) Good for you, for your persistence! The books that have directions and working diagrams give you the order of work. I know, when we've worked with you, we've sometimes switched it up a little to a more logical order. I think the one thing that the books cannot convey is the 'light bulb moment' we all have when it clicks as to how the parts connect, and how the threads really and truly move through the lace. That moment occurs with any kind of learning - not just lacemaking. This part of lacemaking comes when it's ready and our brain is ready to make that connection. We get lots of little ones along the way, and some big ones too. I struggled with gimp outside the pin in Bedfordshire for a bit, and I finally had a light bulb moment in a Barbara Underwood workshop, and it made sense. it wasn't that I wasn't doing it correctly, I just wasn't understanding what I was doing, and the movements made no sense. I I had to recommend just one book about the technique of point ground laces, it would be Ulrike Voelckers " The Grammar of Point Ground". 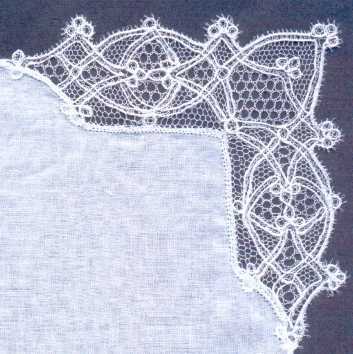 It is systematically covering all the bases and does explain how different ways of working things change the appearance of finished lace, all illustrated in very good diagramms and fotographs. So if you design your own, you will most certainly find it a good reference book on solving next to any problem you might encounter in realizing them. Hi all. Before moving from Washington State to Missouri 5 months ago, I was struggling (and still am) to learn Bucks, and decided to dedicate this year to making it. One thing I'd like to try and understand is (if possible--I don't always "see" things the way longtime Lacemakers do) the choices I have on which area to work in which order in a pricking. That is, most books I own have written instructions and the working diagram, but there are strategies one can employ during working--I know this from one of my excellent instructors, Eileen Collins, from LPS. Is there any way to find this knowledge in books, or, does it just get passed along via word of mouth from people at much more advanced levels of lacemaking than your own who have a "design" brain? Gabriele - show us pictures! I think I should go back to some geometric point ground when I finish my current one. I enlarged the pattern and am working it in black linen. I intend to sew it onto a cotton purse I will make for it. Kate - pick the project that is nearest to being finished, and complete it. Put some nice music on right near you as you work. This has got me all geared up too! I have a cupboard full of unfinished pieces all on pillows and one may have to vacate!